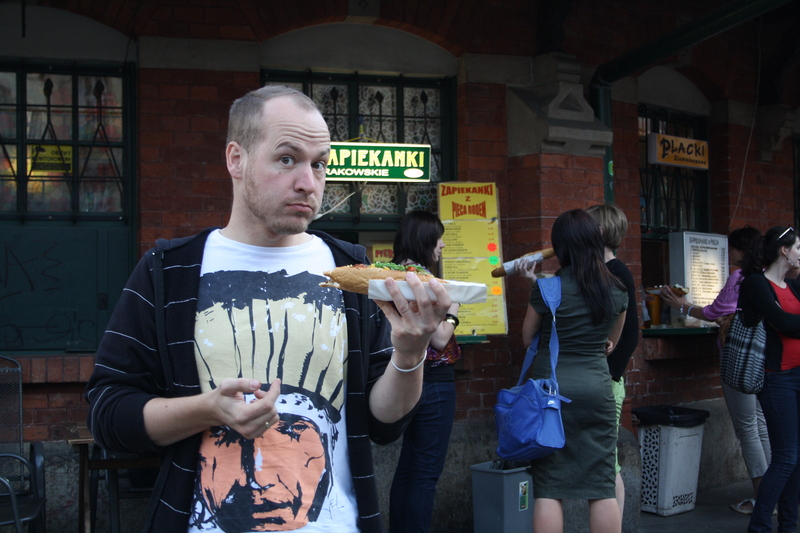 Krakow, Poland – 7/7/2010 | Camperissimo! We slept really well, exhausted from all the physical activity. My whole body ached when I woke up and it was difficult to get off the bed. It was still raining when we got up and decided to start driving towards Krakow where we wanted to watch Germany play Spain in the World Cup. We had breakfast in the parking lot of a supermarket in one of the ugly polish villages we passed through. We couldn’t really see any countryside while we drove because of the houses and heavy industry built next to the road. On one of the petrol stations we realised that my keys for the van, our Munich apartment and the Zagreb apartment were lost. We looked for them all over the van (even in our tiny garbage bin) but they were lost forever and ever. After we arrived in Krakow, we found a nice place to park at the edge of the city park (thank you Google Earth!) and we set of to investigate the town. On our bikes. Yes, on our bikes (the idea alone made my muscles ache but I was strong). After arriving in the old part of the centre, I realised my grey cardigan was missing so we cycled back and found it in the middle of the road. And it wasn’t too dirty! Success! Since we weren’t that lucky with the keys, we had to find a place to make a new set. Eventually we found a place that had our old Fiat model and it was finished in less than 10 minutes. Another success! Everybody was eating one of these sandwiches, so we did too. We cycled around Jewish quarters (Kazimierz) and what used to be the Jewish Ghetto. Today it is a really lovely part of town with lots of small bars and restaurants, Jay said it reminded him of his old neighbourhood in Berlin. We sat in a bar called Ptaszyl in Szeroka Street for a while and then moved to a bar on Plac Nowy to watch Germany lose 0:1 to Spain. They had the world’s biggest sandwiches there – or, to be precise, toasted bread with different stuff on it. It’s apparently very popular because there were lots of people queuing to get it and then standing around, eating it. After a few beers and a quick Polish lesson from the people we met at the bar, it was time to go back to Camperissimo for the night. 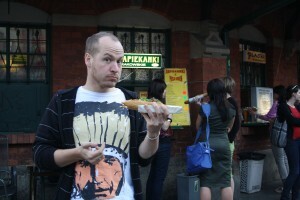 This entry was posted in Camper Trip July 2010 and tagged 2010, diary, food, football, Krakow, Poland. Bookmark the permalink.